Move over Japan. China is making huge strides in the field of weird and wacky. 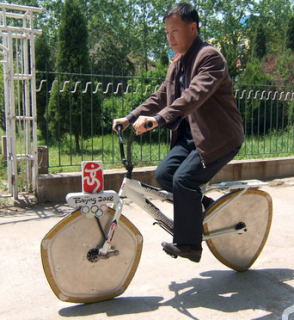 Check out this crazy bicycle with a pentagonal wheel on the the front and a triangular one on the back. It was developed by Chinese inventor Guan Baihua who believes that people will want to ride the bike because it requires more effort than a conventional bike, and thus provides a greater workout for the rider. I am helping a friend sell some bikes. Please contact me at raymondmgeorge [at] gmail.com for more info. Expertly balanced 300ft up a rock face, Khiv Raj Gurjar is the world's finest exponent of Extreme Yoga. Using only a BMX bike for support, 61-year-old Khiv takes the ancient art of meditation to new levels as he performs complex forms of yoga merely inches from the sheer drop. 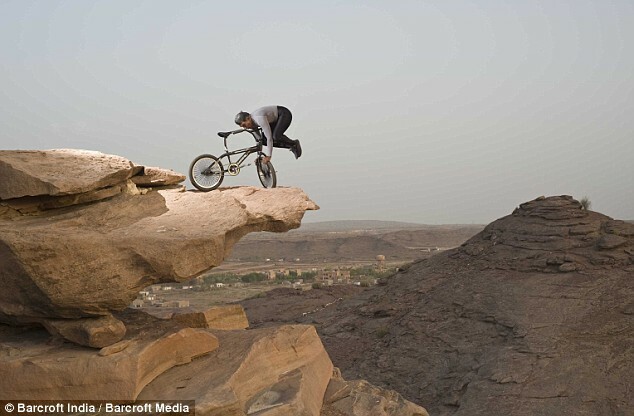 Travelling to the top of the rocky outcrop near to his home of Jodhpur in the Indian state of Rajasthan, Khiv begins his exercises at dawn, so as to avoid the raging desert heat. Bicycle Quarterly is a magazine about the enjoyment of the sport we love. In Bicycle Quarterly, you find professionally written articles. Classic Rendezvous - Dedicated to Lightweight Vintage Bicycles, circa 1900~1983. The purpose of this not-for-profit site is to encourage those interested in enjoying and preserving vintage lightweight "racing" style bicycles of the period from the early 20th century until 1983. The goals are: identification of makers, publishing images of the bicycles & their components, providing key information about the marques & their history, listing resources and, finally, offering camaraderie among the buffs. Please contribute any information or illustrations you might have. Corrections are gratefully accepted. Updates are constantly being made to as new material become available. The most recent changes can be located by the small update note in each section. I would feel bad for myself if I purchased the Langster before the steel version came out. Looks really nice. Could be an addition to my bike collection next year. Or not... I need to finish my vintage Fuji conversion. Real Japanese steel frame. 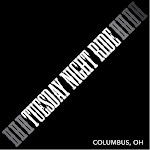 Central Ohio Ultra Cycling welcomes you to the 17th Calvin’s Challenge. While the ownership of the race has change, not much else has. The same great route, the same great weather and most importantly the same great racing that makes Calvin’s Challenge the premier 12 hour race on the UMCA calendar. The following list is things that you may or not need to know depending on the event you are signed up for. We seemed to keep finding things that we feel you need to know to make your race the best possible. While the 12 & 6 hour races are drafting legal, we praise the accomplishments of the individual racer. We encourage you to set a goal, train for it and do the best you can come race day. You will face many challenges, from weather( always perfect) mechanical, intestinal issues, and plain old fatigue. But no matter your final score, know that we are proud that you came and put forth your beast effort. Learn from your mistakes and come back next year stronger and better prepared. Change of Start time for the 6 hour race, from 08:00 to 08:30. We determined that we needed more time to set up after the 12 hour race goes off. The timing clock operation has been changed. Instead of counting down to 00:00:00 at 7:30 pm, it will now read the real time in 12 hour format. (Eastern time). The 6 hour and 100TT necessitated this change. NEW! Pace vehicle to lead the 12 hour group to the first checkpoint at South Solon. We know that a good amount of the “What were you thinking” racing happens during that first leg to S. Solon. Hopefully with “Big Brother” watching the goings on we’ll have a safer race. We really don’t want to disqualify anyone, but at the same time we don’t want anyone killed or injured either. Guess which path we are going to take. At the call for the 100TT (08:35) we need for those racers to move toward the starting line. We will get you out on the course as you line up. No pre determined start roster to worry about. We will send you out at 30 second intervals. 100TT racers must stop at the checkpoints to have their scorecards punched just as the other classes do. Remember, No drafting in the 100TT. If you find another racer drafting you, please tell them that you are in the TT and not to draft you. You will not ride any of the 7 mile loops as part of the 100TT. Since we don’t have a history with the 100TT, the awards will be handed out as best we can determine who the winners are. Bear with us as we fumble our way through this first year. The Fun ride will start after all the races are out on the route. We hope this will be at about 9:00. That doesn’t mean that you have to start your Fun Ride at that time, but we ask that you don’t start before then. Feel free to ride any of the loops as much as you want. While the racers are restricted as to when they can be on the 7 mile loop, you are not. Please do not jump into the race group (s) as they pass you out on the route. The rules forbid them from drafting you, thus you could cause them to be penalized by you being in their group. The Fun Ride riders must obey all the same safety rules as the racers. The Fun Riders will not be scored. At the checkpoints, tell the marshals that you are a Fun Rider. We want you to have a safe ride and hopefully come back next year and enter one of the race events. 12, 6 hour and 100TT racers, please be courteous when passing the Fun Riders. Giving them a heads up that you are passing will go a long way in preventing an accident. Remember that they look up to you with admiration and awe of your abilities. Show them that you can be fast and nice at the same time. To all: The route goes through farm country. You may encounter equipment out on the route. Be careful when passing, much of the equipment has sharp and pointy things on them. There is at least one turn on the route that is always vandalized, it’s become kind of a tradition. We will put road markings way before the turn (more like the left of a “Y”) and markings on the wrong way. There are some deep pot holes on the 7 mile loop. Hopefully they will be filled by race day, but maybe not. We marked them with paint, but if you ride into one of these holes, you’ll go down. No parking behind the school. There is a school activity going on the same time as the race and we have been asked to share. The school has been very kind to the race, so please, let’s do everything we can in return. If you are new to ultra racing, we encourage you to check out www.ultracycling.com It is the definitive source for long distance racing information. Learn about RAAM, RAAM qualifiers, 12/24 hour races, double centuries and how you can participate in a national points championship. The UMCA is the sanctioning body for cross state records. If you found that you like this kind of event, we can recommend a few others. Most importantly, we could not do this without the many volunteers that do everything from helping you park to punching scorecards and keeping you safe on the route. Keep in mind that many of them were racers at one time, and are now are giving back to those that helped them to reach their goals by helping you reach yours. When you have reached your goals, please consider volunteering at a race or event so that the success that you have enjoyed can be passed on to the next generation of ultra racers. We want your feedback. We will have a page on the Calvin’s website blog that will allow you to make comments about the race. While we hope you will have some good things to say, we also need to hear about any problems you may have encountered so that we can make improvements for next year. On behalf of the Race Directors Jeff & Julie Stephens, Christine & Larry Graham we want to thank you for supporting Calvin’s Challenge and hope the rest of your season is safe and you reach your goals. The UMCA recognizes records by gender and age. Records may be set by solo riders, tandem riders and 2- or 4-person relay teams. Record setters receive a UMCA plaque and are recognized in UltraCycling magazine. Organizes the UMCA Year-Rounder Challenge. The Year-Rounder showcases consistent performance in cycling throughout the year. The Y-R includes the Larry Schwartz award which recognizes riders who complete (at least) a century every month. Riders earn certificates, medals and plaques and top riders are recognized in UltraCycling. Sponsors the Ultracycling Cup Competition. The UCC is a series of races to determine the best ultra racers of the season, with divisions based on age and gender. Riders earn medals and plaques and are eligible for prizes. Top riders are recognized in UltraCycling. Certifies ultra cycling records. Setting a record is a significant achievement for an endurance cyclist and a great way to prepare for racing. Records are categorized by age and gender and may be set by solo riders, tandem riders and 2- or 4-person relay teams. Record setters are awarded plaques. Sanctions qualifying for RAAM. Qualifying for the Race Across America is the highest achievement for an ultra cyclist other than finishing RAAM itself. RAAM-qualified riders receive a UMCA plaque. The UMCA also sanctions the Race Across America. This was my first time on a tandem. My friend Mary, who is Executive Director for the American Council for the Blind in Ohio, has asked me for over a year to be captain on her tandem. So when the email came in last week I decided to "just do it". We started at the Hoover Dam parking area. After pedal installation and seat adjustments, plus a spin around the parking lot we were off. The bike has bar end shifters which I was not used to. Tandems take a lot of work versus a regular bike. Some common issues that need to be worked out include, which side of the bike you dismount, starting together without dragging foot on ground (me), and making sure the stoker knows when to coast (again me). Slowly I learned to do these things as the day wore on. The route took us north and then west to Delaware to Bun's Restaurant. I has the philly steak sandwich which was pretty good. We headed back along the river which was a nice change of scenery. Temps got into the mid-80's and was clear and sunny. I rode Pedal Pittsburgh last year, but this year it seemed a little easier. The organizers removed the climb past the Igloo at the beginning, but I don't know if that was it. I could be in better shape this year. : ) I recall we took almost 8 hours to ride the 60 mile route last year, but I realized we stopped a lot for one member of our group. Not this year, we took very little breaks. We started the ride around 8:30am and finished 12:30pm. We did the 50 mile route which did not include Mt. Washington. The route ended up being 45 miles though, because we cut out a section that we knew from last year was not that exciting. Another change this year was the start/end was at Southside Works. A little more confusing for parking, but it was a nice atmosphere.